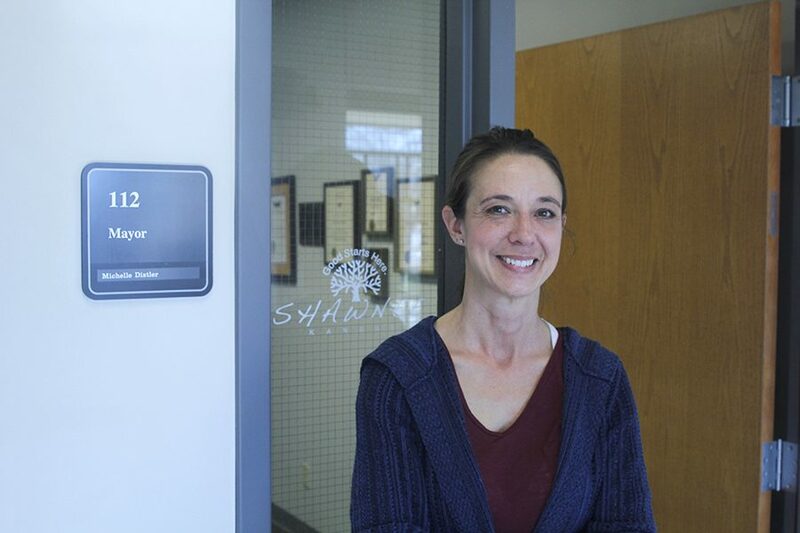 Mayor of Shawnee Michelle Distler discusses what she hopes to see in Shawnee on Nov. 22. What first attracted you to public service? The love that I have for this city. I am a lifelong resident of Shawnee and I just absolutely love the city. I hate politics. I don’t think anyone in their right mind would subject themselves to this if they didn’t have a reason, and my reason is the passion that I have for Shawnee and protecting its history and preserving its present and future. How long have you been in public service? What made you decide to run for mayor, if you don’t particularly have a love for politics? [First,] for city council, the member in this seat became the election commissioner, so he had to step down from his council seat because it’s a conflict of interest. To me, it’s very important that people elected in the seats to represent the people, communicate with the people and that they’re transparent with the people. The person that had been appointed didn’t return phone calls, didn’t return emails — I don’t ask anyone to agree with me, but to at least respond to me. That’s huge for me. I wasn’t receiving any responses. Then, a bunch of people kept trying to get me to run — my second grade teacher, the neighbors, all these people were coming out of the woodwork. And I said, “No, I’ll stay on this end of [politics]” because I did attend meetings when there were things of interest to me, even though I wanted nothing to do with the other side of that bench of politics. The last day to file came, and no one had filed against this person. That person [couldn’t] go unopposed, so I filed. And then I won. But, it was a very short amount of time where I saw that I could still continue to serve in this capacity just like I could as a citizen, and maybe even more so. And when Jeff Meyers decided he didn’t want to run anymore, the same thing happened. I had zero interest in being mayor. I had prayed about it because I had this pull that I was supposed to be doing this, though I didn’t want to do this. You can argue with God all you want, but He’s always right. So I filed again, and I won. It turns out I’m the first female mayor of Shawnee. What’s your background? I assumed you had a background in politics. No, my background is just my passion for the city and its history. Career-wise, I’ve never done anything in politics. My bachelor’s degree is organizational management in leadership, my master’s degree is human resources development and organizational development. I voted in every election. I did my duty and I voted, but I didn’t work for candidates. I had zero political experience. So, you said you had a love for the city. What do you see in Shawnee that makes it unique? We have such a unique history. We became a city in 1856, which is five years before the state of Kansas was even a state. We have a history with the Stonemasons, German and Belgian families and the truck farming. You’ve probably seen Caenen Castle, there’s the Kenneth Smith home and that stone structure outside Garrett Park. Kenneth Smith made custom golf clubs, and huge celebrities would come to Shawnee, Kansas to buy this man’s golf clubs. He would do certain measurements and different calibrations to customize them to each individual to strengthen their game. Kings from other countries came. So many people came to Shawnee, Kansas for the Kenneth Smith golf clubs. Nobody else has that. Another thing that is unique about Shawnee is that, for the past two years, all of our leadership has been female. The Garrett brothers were the Stonemasons that built all of the beautiful buildings that you see on the Kenneth Smith property. As you drive past there, the rock fence is still there. Those are still standing from the 1800s, when they first put them there like that. It’s such a cool property. The one thing that comes up at all of the [events I hold] is that nobody can quite put their finger on what’s different about Shawnee from Lenexa, Merriam or Mission. [What sets us apart is that] everyone says we have such a small-town feel, but we still have all the amenities of the bigger cities. It’s funny to have that small-town feel because we’re the third-largest city in the county. We have 65,000 people and 42 square miles, and everyone feels like we have a small-town feel. How cool is that? We have Shawnee Town 1929, which is the only museum in the world that focuses on 1929. Originally, I struggled with that because why are we focusing on only one year? But that’s really when Shawnee was booming as a truck-farming industry. So, while the rest of the country was suffering, we were doing good because we were doing truck-farming. We had our German and Belgian immigrants doing farming and taking their stuff down to the City Market. That’s why they focused on that year. While the rest of the United States was suffering with the Great Depression, we were actually doing pretty well. I’ve given you too much! Can you tell how much I love the history of Shawnee? Is the history the main reason you love Shawnee? That’s a big reason, but it’s just my home. I grew up in Shawnee Village. All the homes [there] were built identically for men coming home from the war; [each house is] 600 square feet. [My house] had no basement, it had a one car garage and it was under the water tower. That was so cool growing up. I could ride my bike wherever I wanted as long as I could see the water tower because that’s how I [would] get home. So, that’s unique, that we had these homes built. When I was growing up, they all helped each other. It’s still very unique like that in Shawnee Village. I can’t figure out what that is because it would be great if we could get the rest of the city with the same kind of mentality. What were your goals going into office? One of the things I like to do is recognize good service. So, if I’m at Applebees and I get good service, I leave a “You’ve Been Spotted by the Mayor” card and I’ll write a note on the back. If you think about it, when they’re giving good service, we need to recognize that. Because we want to give people good service, we want people happy shopping and dining in Shawnee, because those sales tax dollars stay here. So when I get good service — and nobody knows who I am, so I’m not getting special treatment — I like to recognize that. Some of them make comments like, “I’m just a server” or “I’m just a waitress.” But, they’re making an impact on the community they’re working in, because they are a part of the difference of whether [consumers] stay here or they go somewhere else. So, with good service, you don’t think of it [as important] because you’re just doing your job, but it’s really making a huge impact that we need to realize. I just want us to do as much as we can, because the world is such a negative place right now. I want Shawnee to be different. How has Shawnee changed since you were elected? I think it’s being recognized that we are so accessible now. I bring staff to a lot of different events so that they can teach about a lot of different things, and it’s being recognized and appreciated that we’re getting good information out. With some of the local elections, people were stating information that was just completely incorrect. I don’t know why, but either way, they were putting out false information. So, it’s a constant, exhausting battle to put out the good information out there because we want people to have an informed opinion based on fact. That’s been a part of what I’m trying to do, too — educating the public on how the incentives work — just so that people understand. So many people think we’re just giving away their tax dollars, but that’s not what we’re doing. Just trying to educate and get good information out is very important to me. I think a lot of that has changed. What do you hope to do for the rest of your term? More of the same. I don’t want people to feel like they have to fight city hall. We’re here to help them and we’re here to help take care of them, with their streets, parks and public services. I don’t want people feeling like they have to fight us. Just talk to us. What can we do? How can we fix this? I’m hoping we can get the momentum going on a cultural change within this city that is different than everywhere else. Because we have that small town feel, we can do this. We can make Shawnee a better place to live than any place else. What are some ongoing projects in Shawnee? Nieman Now! is a big project that’s going on. I have a hard time understanding how it’s going to work, but I’m excited about it. I hope it turns out to be this bigger, beautiful project. Andy’s Frozen Custard is coming and we have businesses coming in like Raising Canes, but we don’t want to lose our great family businesses either. It sounds like you’re always on the job. Yeah, [being mayor is] 24/7. In addition to that, I have a full time job, a part time job and a 12-year-old daughter. What’s it like balancing everything? I have to be extremely efficient and manage my calendar very well. Most of the time, things go pretty smoothly, but sometimes at my paying job, meetings will run over and I’ll end up missing a ribbon-cutting [ceremony]. But, that doesn’t happen very often and it’s out of my control. Why do you choose to reach out to people in those smaller settings? We mostly pay attention to Mill Valley Days, but you’ve mentioned doing other things too. It’s more personal, rather than me just standing up to a group and giving a speech. That’s another thing I’ve done. Every new business that comes to Shawnee, I hand-write them a card welcoming them to Shawnee. Every time a Shawnee resident accomplishes something, like if someone is celebrating their 100th birthday, a 50-year anniversary or an accomplishment, I hand-write them a note congratulating them. I want to congratulate them for representing Shawnee well. I’m proud of that; I’m proud to get to be [their] mayor. [Another change would be] the volunteer certificates we give to thank the volunteers in the city — they used to print the signatures on there. When I became mayor, I said, “No.” If they spent their time putting their hours in for the city, I can take the time to personally sign their certificate. As I’m signing them, I’m seeing their names. I do personal letters and cards. It’s important to me. How do you feel about your service as mayor? I don’t know. That question might be better asked of the residents [because it is] about if I’m what they want. I’m trying my best and I’m trying to do what’s best for the city. Hopefully, it’s what the people want. That’s one of the things I feel very strongly about, too. A lot of criticism comes from misunderstanding, but I learn the most from my critics. They make me think outside the box and they make me think more in depth by questioning things. I’m always appreciative of the critics who ask questions and want to look at information deeper. What do you want for the future of Shawnee? I want a happy, healthy community. I want people to feel like they are part of a community, and not just part of a city.